This book was recommended to me by one of the librarians at the Lockport Library. It would be fair to say that when I started it, I was not over enamored with the writing style. There were moments that I wasn’t sure I was going to finish it. But, I soldiered on, and by the end, I had about the same emotional response as I had at the end of Where the Red Fern Grows. 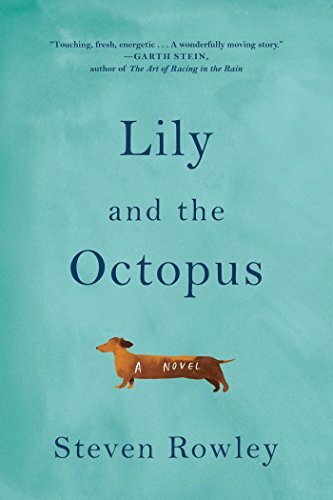 Lily and the Octopus by Steven Rowley is a love story between a man and his dog, and a love story between the man and his ego. This is the story of Ted Flask and his dog, Lily, who has a tumor growing that will kill her. Flask personifies the evil tumor by making it a sentient and philosophical octopus. It is this octopus that destroys the true love between a man and man’s best friend. I read this book at the same time that my parents had their dog pass away, so there was a bit more emotion with reading this novel. That is actually one of the highlights of this book. The author was able to transfer his emotions to the page for all of his readers to feel. It is a book that will tug at the heart as you read it, especially if you’ve been through the trials and tribulations of having to go through the experience of a dying pet. The thing that grated on my nerves immediately was the incessant pop culture references. On page after page, there are movie lines, actors, songs, and other trivia just thrust into the narrative. I think I got about 25 pages in before I threw my hands up and just started skimming over those extraneous parts. As the story went on, the main character got more and more self-indulgent. He was frankly one of the most unlikable characters I’ve read in a long while. On the flip side of that, the voice of Lily was fantastic. You knew reading the words that it was coming from a dog’s mind. I loved when Lily told Flask that she thought of his as “That Guy.” It was perfect. There was one rather long fantasy sequence in the middle of the book that was 95% awesome. I knew that it was all in his mind, and the action with the unknown sailor was fairly obvious. It was extremely well done. Well, it was great until the end when the author explains every bit of symbolism in that chapter. Honestly, you have to believe that your readers are smart enough to get what you’re trying to say. You don’t need to give a play by play explanation of every symbol used to create the story. Another positive for me was the flashback scenes, where we learn the backstory about Flask getting Lily and the adventures they shared when she was a pup. There were points I smiled while reading those parts. And I’m not going to lie -- there was a point where the vision got pretty foggy. It’s the animal lover in me. This book has fantastic reviews on Amazon. I don’t generally use those reviews for very much other than to see if people read things the same way I did. I feel that I am in the definite minority when it comes to my critique of this book. That’s not to say it’s not a great book. It surely is. In my opinion, it needed a bit more editing and more tightening with the narrative. The underlying story is one of love between a dog and its owner. Anyone who owns a dog knows the pure joy displayed by your pet when you walk through the door after a long day at work. That very essence is captured very well by Steve Rowley. Once you get past the pop culture detours and the failed relationship self pity, this is really a good book. 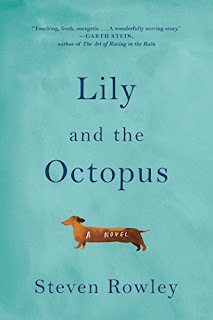 Lily and the Octopus by Steven Rowley is a good book that verges on being great. With a little help from a good editor, his writing could go a very long way. If you’re a dog person, or an animal person, this is the book to read. I would caution you not to read it if you’ve just lost a pet, or are going through hard times. The message is pretty powerful. Craig Bacon currently has two kittens, but he had dogs growing up. He’s had pets nearly all his life. They are fun and others members of the family.